CHRISTIANS ACCOUNT for just one percent of Japan’s population, but no one can spot the potential for a good festival better than the Japanese. That’s why they’ve adopted Christmas, with all its secular symbols, as a winter festival of light–most fitting for the time of the year in the northern hemisphere with the least amount of daylight. One of the most attractive aspects of the season is the Japanese use of the Christmas tree as an art form. Here are some of this year’s examples. 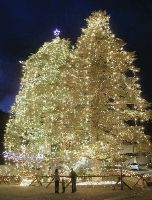 Local volunteers in Nanyo, Yamagata, began decorating a 25-meter fir tree at a local primary school in 2003, and they’ve continued every year since. They’ve also been adding to the amount of bulbs they use to trim the tree, and this year they hung 20,000 in four colors. This is actually called an “illumination event” because the tree will be lit every night from 5:00 to 9:00 p.m. until mid-January, but that didn’t stop the piano, flute, and violin trio from playing Christmas hymns as well as selections from the classics at the lighting ceremony. What’s better than having a Christmas tree? Two trees! These two fir trees down south in Yamaguchi City, 26 and 20 meters high respectively, are estimated to be 450 years old. They’re festooned with 35,000 lights hung by 50 volunteers. If you’re in the neighborhood, you’ll be able to see them until 10 January. 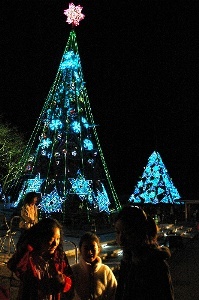 This tree in a park in Anan, Tokushima, is only 15 meters high, but it’s decorated with 500,000 light-emitting diodes. 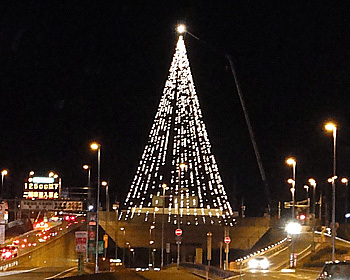 A lighted Christmas tree is not just a seasonal decoration here—it’s part of the Anan Luminous Town Project that’s been held two or three times a year since 2003. This December was the 17th time the project was presented. Anan is a luminous town because it’s the headquarters of the Nichia Corp., the nation’s largest LED manufacturer. The Tokushimanians devised a new way to build their tree this year. Previous trees were raised on site using ropes or a crane, but this year’s model was built with a bamboo frame. Nothing says Christmas in Asia like bamboo. A total of 120 lengths of 4-6 meter-long bamboo were used. 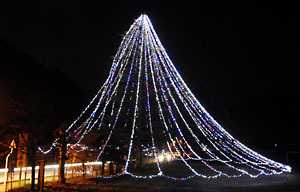 They liked the idea so much they also built a 10-meter-high bamboo pyramid and bamboo wreaths. In addition to being one of the Christmas colors, green is also the color of the ecological movement, and one way the Japanese put the green into Christmas is to make trees out of used PET bottles. Here’s a 7.25-meter PET bottle tree at the L’Espace City shopping complex in To’on, Ehime. How interesting that the “green” tree is blue, but that won’t surprise anyone who understands the language. The tree wasn’t erected solely to raise ecological awareness—it also is to celebrate the 10th anniversary of L’Espace City. That’s why the 16,000 LEDs will be lit from 5:00 to 10:00 p.m. until end of January. It was assembled by a non-profit and some private companies in the city, which started collecting bottles at schools and shops in the fall. They found more than 10,000 in three months. This PET bottle eco-tree adorned a Fukui City parking lot. 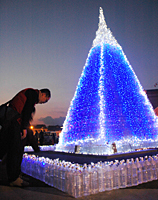 Fukuan adults and kids have been trimming PET bottle trees in public for the past four years, and they used 700 PET bottles and electric lights for this year’s five-meter creation. To add to the holiday atmosphere, two Santa Clauses passed out candy, and they drew a picture of Snow White on the side of an adjacent building. The kids also built a haunted house. Why? Because it’s Christmas! 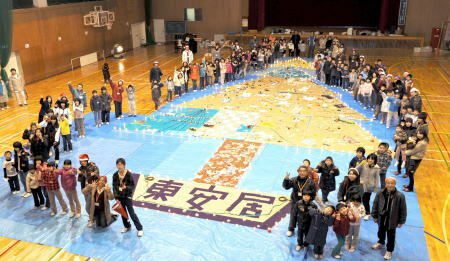 Fukui City adults and children also worked together to build this cardboard Christmas tree designed to lie on the floor of the gym at the Higashiago Primary School. The Christmas celebration for the grade schoolers included several events, including reading aloud from storybooks and group singing. This tree was created by 150 people working in groups of six or seven. It was 15 meters high and nine meters wide, and decorated with ornaments made from wrapping paper and milk cartons brought from home. They also set up and lit 200 candles in the form of a tree, and then went up to the second floor to enjoy the results of their handiwork from on high. What else can be used for Christmas tree material besides PET bottles, bamboo, and cardboard? Glass! The employees of Aqua World, the Ibaraki Prefectural Oarai Aquarium, created this glass tree from 108 individual pieces with tropical fish inside. 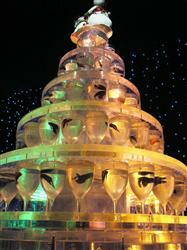 They wanted small colorful fish for the decorations, so they chose the betta Siamese fighting fish. That breed is well known for aggressively defending its territory and fighting until the finish. Territorial disputes aren’t really in the spirit of the season, so the feisty fish have been isolated from each other within the tree. A lonely Christmas for them is the best solution for everyone. 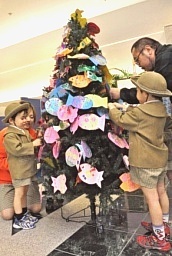 Speaking of fish, the Kagoshima City Aquarium had kindergarten students from 42 schools in the city work since early November to create fish ornaments for their Christmas trees. Yes, trees—they had 34 in all spread throughout the facility. Now how’s that for a scheme. They got the kids to do all the work of making Christmas decorations and called it an art project! The Japanese are known for their appreciation of ephemeral beauty, and here’s an excellent Yuletide example. The ANA Hotel Clement Takamatsu in Takamatsu, Kagawa, arranges the lights in 46 guest rooms on the northeast side of the building on floors 5-19 in the shape of a tree. They ask the guests in the other rooms on that side of the building to shut the curtains, and the result is a tree pattern that is 48 meters high and 43 meters wide. The hotel does this only on Christmas Eve, and for only one hour, starting from 6:00 p.m. The more you think about it, the more Zen it gets! Drivers in Mino, Osaka, can’t miss this tree, nor have they for the past 15 years. This creation of the Mino Chamber of Commerce is almost impossible to miss—it’s 50 meters high and towers over the Green Road Tunnel. Christmas is not always filled with peace and light, as louts are on the prowl every day of the year. 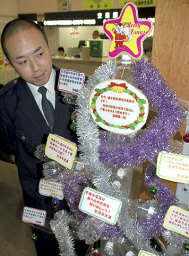 To remind everyone of the need to be alert even on 25 December, the police department of Muroran, Hokkaido, made a tree of 30 PET bottles decorated with handmade Christmas cards from each of the separate bureaus. Instead of the generic “Peace on earth, goodwill toward men”, the cards contained crime-busting messages, such as “Don’t forget to lock the windows and doors when you go out.” Said the Muroran police chief, “A safe and sound yearend is the best Christmas present after all.” The kids might not agree, but their parents probably will. Incorporating the Christmas theme with all sorts of national symbols is a seasonal tradition everywhere, and Japan is no exception. That might be one of the reasons the Fuji Q Highland amusement park in Yamanashi built a 60-meter-high, illuminated steel frame representation of Mt. Fuji in their parking lot for the season. It’s decorated with 100,000 LEDs. 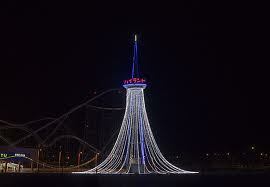 The park says that other than free-standing electric towers, it is the highest illuminated object in Japan. Snow is a key part of Christmas music and imagery, even in places where it doesn’t snow. So in keeping with the seasonal theme, here’s a photo of the first snowfall on Mt. Fuji in Yamanashi in November. Luckily it includes some Christmas reds for contrast. Snow has dusted the summit since 25 September, but this was the first time the whole mountain was covered. It was – 1º on the ground when the picture was taken but -12.1º on top of Old Snowy. Makes me glad to be in Kyushu! Yes, this Ampontan Christmas card is a day late, but accept it in the spirit of Suzuki Saeko—don’t you wish it could be Christmas every day? If you’re still in the seasonal mood, click on the Christmas tag for some truly inspired trees from previous posts. This entry was posted on Sunday, December 26, 2010 at 3:50 pm	and is filed under Holidays, Popular culture, Social trends. Tagged: Christmas, Ehime, Fukui, Hokkaido, Ibaraki, Japan, Kagawa, Kagoshima, Osaka, Tokushima, Yamagata, Yamaguchi, Yamanashi. You can follow any responses to this entry through the RSS 2.0 feed. You can leave a response, or trackback from your own site. They don’t celebrate Christmas, they celebrate winter solstice. What’s the point of calling it “Christmas” if they make no mention of the figure that the holiday is supposed to be about? Z: Thanks for the note. They’ve adopted/adapted it to suit their own purposes, for their own enjoyment. Everybody does that sort of thing, but the Japanese are particularly good at it. At least the Japanese version of Christmas has no pretensions of being anything more than a nice excuse for a little gift giving and kanoodling (if you’re lucky), the version I see in N.America is a sickening display of mass consumerism and one-upmanship, which hogs the spotlight away from the true meaning of the holiday as a time of celebration with family and faith (and arguably a minor one in the Christian religion, with Holy Week/Easter being much more important/significant to many of the observant).